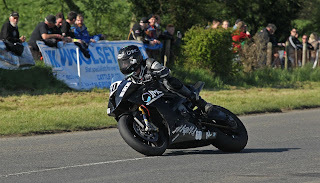 Team NW Racing are just back from a successful Tandragee 100, where team rider Darren Cooper excelled as a newcomer, and came away with a fine third place in the Supertwin race. Darren started the day finishing 22nd in the Open Superbike race, and followed that by finishing in an excellent 13th place in the Tandragee 100 Superbike race, and he also set his fastest time of the day at 102.22mph. Darren was also taking part in the Supersport 600 race where he finished in a fine 12th place, and the finished the day with a brilliant third place in the Supertwin race. Darren Cooper; “I really enjoyed the whole weekend and it is a fantastic course. The racing was very close, and I enjoyed every race, especially the Supertwin. As I was riding three different bikes, each bike has its own way, and you have to be really concentrating. I was still learning the course, but the more laps I did on the BMW the better I got. The bike really handled well, and I am looking forward to the North West, and hopefully the weather will be as kind to us as it was on Saturday. The team are really gelling together and I know that it is only two races into the season, but everything is going to plan. I was delighted with the way the meeting was run, and I would like to thank Anne Forsythe and her team for the way they ran the meeting, and also the way we were looked after”.